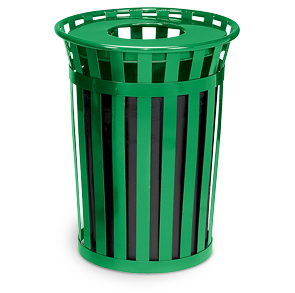 Made of durable, long-lasting 10 gauge galvanized steel with 1/8" x 2" flat steel slats, and reinforced with circular metal bands. Lid comes off easily for quick trash liner removal. Lid attachment kit includes an encapsulated cable to keep lid secure to unit. 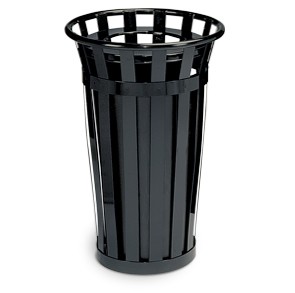 Comes standard with a black low density poly urethane rigid plastic liner. Available in your choice of lid styles: flat top, rain cap, ash urn or dome top. Anchor kit includes hardware for surface mounting. Choose from the TGIC polyester powder-coated color options shown. 24 Gallon Lid | 18-3/4"I.D. 36 Gallon Lid | 23-3/4"I.D.